During the last three years a new name has been making waves at Ostgut Ton and Berghain: Berlin born, raised and based producer Kobosil made his debut with a remix of Barker & Baumecker's “Silo” (Ostgut Ton, 2013), completely unknown at the time, he has quickly earned his stripes as a DJ on the club's main floor, eventually becoming a resident at Berghain. Following up on five subsequent 12" releases and Kobosil’s first live sets, his debut album sees him covering yet new ground in the form of a full length release. Titled We Grow, You Decline the eleven new pieces dare you to readjust your perception of Kobosil's previous releases and invite you to listen carefully – in a more quiet environment than the usual dancefloor setting. We Grow, You Decline marks a swerve from club-contextual tracks towards a more musical, multilayered song format, but it's worth mentioning that the album is not a reinvention of Kobosil's past production efforts. There have always been distinct hints of his fondness for more abstract, non-dancefloor rhythms, discomforting sounds and mindful listening in his young discography – most notably “Plant 5”, “Less” (RK3, 2013), “Herschel” (Unterton 05, 2013), “There” (MDR 10, 2014), “Head” (RK1, 2014) and most recently “Athtar” (O-TON 91, 2015). With his debut album Kobosil delves even deeper into Ambient and Industrial soundscapes. Drawing influences from Musique Concrète via Electronic Body Music towards present-day Techno, the tracks combine gritty textures with melodic hints and contrasting bleak off-beat rhythms with Drone passages. This album doesn't cater for certain expectations and the opening title “Telling The Truth” is already leading astray; its steadily increasing synth pulse and constant crackle don't culminate in a maximalist floor pleaser but segue into the field-recording-led Dub Techno cut “To See Land” and the hissing melancholy of “Reflection”. "The Exploring Mountain” follows this vibe by asynchronously intertwining a hollow kick drum with organic percussion and distant bells. This piece serves as the album's first predetermined breaking point. Its final kicks anticipate Kobosil shifting his focus towards a more Techno led middle section in form of the hypnotic “Aim For Target” with its slow but steady build-up and subtle, swirling melody. Meandering, brittle harmonies first introduced to the Kobosil sound on his recent 91 EP (“Avernian”, Ostgut Ton, 2015) also find their way into “The Living Ritual”, topped with his trademark kick drum, alienated percussion and a beguiling synth layer towards the end – both tracks would suit Berghain's main room perfectly, but in the album's context they simply form one of many layers. We Grow, You Decline adds new aesthetics to the Berliner's production style by conveying a certain darkness and distance while keeping some easy and gentle touch. Underneath the delicate, crackling surface of songs such as “When I Speak” and the aforementioned “To See Land” there are distant voices to be heard, while they're more prominently featured in the throbbing, atmospheric “Eihwaz” and the robotic pulse of “You Answered With Love”, the human element is kept restrained and unfathomable inside some tense moods. With "They Looked On" Kobosil unchains the listener during the over eight-minute-spanning, culminating last track and the hovering suspense that is prevalent throughout the album is dispersed into a warm, hazy horizon. 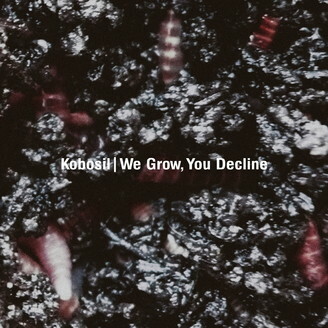 We Grow, You Decline is a bold statement from Kobosil’s growing musical repertoire and a reflection of his multi-faceted artistic development by expressing his own artistic voice without ingratiation in the form of conformity. Music, bright like a smile and dark as the soul.